"For the honour o Italy"
Location o the Italian Social Republic within Europe in 1943. Territory o the Italian Social Republic throuoot its lifespan. 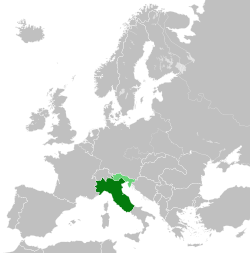 The Italian Social Republic (Italian: Repubblica Sociale Italiana, RSI [ˈɛrre ˈɛsse ˈi]), informally kent as the Republic o Salò (Italian: Repubblica di Salò, pronounced [reˈpubblika di saˈlɔ]), wis creatit during the later pairt o Warld War II (frae 1943 till 1945). This page wis last eeditit on 9 Juin 2016, at 21:24.